It's Thursday, my favorite day of the week. What are you reading this week? I'm just a little into M.B. Shaw's debut mystery, Murder at the Mill. It's not Shaw's first book, though. She's a bestselling author under Tilly Bagshawe. 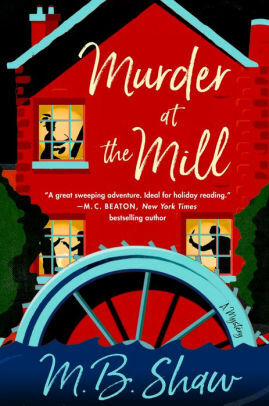 This one is about a portrait painter who gets caught up in the intrigues of a village and estate in England at Christmastime. She's renting a cottage on the estate, and painting a portrait of the owner when the youngest child of the family finds a body on Christmas day. I have to admit, it's a little slow-going at the beginning, so I've been picking up a couple other books in the meantime. I have a question for those of you who are regulars here. Every year, I do a posting of my favorites of the year. I'll run mine at the end of 2018. This year, some of you contributed wonderful posts of your favorites of 2017. I posted them each Thursday, along with What Are You Reading? Who would like to do it again? Let me know if you want to write a piece, and start thinking about your favorite books from 2018. What are you reading this week? Are you plowing through a book, or have you found something that excites you? Let's talk books. Labels: Favorite Books, What Are You Reading? Good idea, Lesa! WE are leaving early for Florida this year - January 3, and I can't wait to get out of this cold - so will try and think about favorites as the end of the month approaches. I feel like I've had a down year reading, at least as far as sheer numbers go. Too many weeks like this one where life intervened and just didn't give me as much time for reading as I would have liked. I'm reading O. Henry's HEART OF THE WEST (orig. 1910), and one of the stories was "The Cavalier's Way," the story that introduced The Cisco Kid. Let's just say he was not a heroic figure in this one. I did read Stephen King's ELEVATION, which you recommended recently, and enjoyed the short tale (he calls it a "novel" on the cover, but we don't have to). Anyone who gets the significance of the dedication to Richard Matheson and the "homage" naming of his protagonist as Scott Carey should be able to partly figure out where it is headed. I have not had much time to read Lee Child's PAST TENSE, but it is due next week so need to get back to it. I have been reading James Mustich's 1000 BOOKS TO READ BEFORE YOU DIE, and was pleasantly surprised at how many of them I have read. I finished THE DARLING DAHLIAS AND THE POINSETTIA PUZZLE by Susan Wittig Albert. She seemed to wrap up a lot of loose ends in this one so I am wondering if the series has reached its end. Now I am reading THE HOUR OF DEATH by Jane Willan. Sister Agatha is not disappointing in this second installment. I just love her channeling Agatha Christie and other famous mystery authors in her investigations. DECK THE HOUNDS by David Rosenfelt. It’s the first one I’vevread instead of listening to the audiobook and I prefer this series in audio. An ARC of THE GOOD ONES by Jenn McKinlay. It’s a quick romance. I enjoyed the fact that she featured King George the kitten her family rescued in the book. An ARC of DEATH AND DASIES by Amanda Flower. It’s the second in her magical Garden series set in Scotland. I enjoyed it even though the garden and the paranormal elements didn’t feature as much in this book as they did in the first one. So keep that in mind, Jeff! I'll take a submission anytime, and then post it on a Thursday in January. You don't have to wait until you're in Florida to send it to me. Like you, I think I'm going to have to bring Past Tense back to the library. Others are waiting. I can go on the bottom of the list. No hurry. I just got an email that the new Steven Havill book is waiting, and I have Allen Eskens and Ken Bruen's new Jack Taylor book, both of which are calling to me more. Sharon, I need to find my copy of Jane Willan's first book. Everyone raved about it, and it's someplace in those piles. Sandy, King George is in Jenn's book?! I love it. I enjoyed Death and Daisies. You're right, Jeff. The new Steven Havill! I always enjoy those. He had a few little surprises in this one, but, thinking back, they shouldn't have come as a surprise to those of us who follow the series. Nothing Stays Buried by P J Tracy ~~ great books, had tears again at the last few pages. Had to stop reading No Cats Allowed by Miranda James ~~ it was a ebook from RBDIGITAL, time ran out and I couldn’t renew it because others had holds on it. I have put a bold on it. Will pickup where I left off when I get it again. Reading is a pleasure I look forward too each day. How about you? Kate Carlisle - ONE BOOK IN THE GRAVE - one of her bookbinder books that I listened to on a CD while heading to Ventura CA. Laurie Cass - BORROWED CRIME #3 - a librarian who drives a bookmobile in Michigan - fun and light entertainment. Rebecca Alder - HERE TODAY, GONE TAMALE #1 about a journalist who lost her job and went home to her childhood home in Texas and is working at the family restaurant. A quick fun non challenging read. Next up was a darling picture book by Andrew Martitila - CATS ON CATNIP - nothing but photos of cats on catnip. No text just pictures but if you have a catnip cat you will totally enjoy the pictures. Jean Flowers in the third postmistress book ADDRESSED TO KILL - entertaining but I did not enjoy it as much as the first two. Finally last evening I started Betty Webb's THE OTTER OF DEATH - love this series and I understand that she wanted this to be her last book in the series but her editor told her that was not going to happen. Lighthearted and fun compared to the Lena Jones books which are very intense. Sure, Lesa, I'd be happy to submit a "favorites of the year" posting again. Thanks for asking. In EVERGREEN TIDINGS FROM THE BAUMGARTNERS by Gretchen Anthony, Violet is a well-to-do perfectionist who annoyingly tries to control everything and everyone, including her family. She has come to terms (barely) with the fact that her intelligent and accomplished only child, Cerise, is a lesbian, but when she learns that Cerise is pregnant, she can't deal with it until she finds out who is responsible--certainly not her partner, Barb. We find out a lot about the family's past from the annual Christmas letters Violet has written--a clever conceit. But I found the only realistic, grounded characters to be the younger ones--Cerise, Barb, and Cerise's lifelong best friend. A couple of the scenes are over-the-top slapstick, which are not to my taste. At times I didn't like the story, but I'm glad I kept reading because the ending was gratifying. This debut writer has a lot of potential. As Lesa indicated in her review, NOVEMBER ROAD by Lou Berney successfully evokes late 1963, following JFK's assassination. Handsome Frank is a successful fixer for the mob in New Orleans who suspects he may be implicated in the assassination because of a seemingly innocent assignment he carried out in that area of Dallas. He goes on the run and teams up with Charlotte, who is fleeing with her two young girls from a disappointing life in Oklahoma with her husband, a hopeless drunk. I enjoyed this quick read but found Berney's earlier work, The Long and Faraway Gone, to be superior. If you love the TV series as I do, you will absolutely adore THE STORY OF THE GREAT BRITISH BAKE OFF by Anita Singh, a behind-the-scenes view of the program, which has been a phenomenon in the US as well as in Britain. You will learn things about the hosts and judges (the early ones and the new ones), the venue (that tent! ), the contestants, and the inside secrets and mini-scandals, and there are some great photos. Tp my delight, I found there are a couple of seasons I have missed and can catch on Netflix! I heartily recommend it. Louise Penny is a master of the literary mystery, with legions of fans and a huge stack of awards to prove it. I enjoyed KINGDOM OF THE BLIND, although it's not one of my favorites of hers, but after 14 books in the Armand Gamache series, I'd love to see her publish a standalone with completely new characters. Sacrilege, you say? I’m just 20 pages into Murder on Cape Cod, the first in a new series from Maddie Day, aka Edith Maxwell. So far, I’m really enjoying it. Oh, yes, Charlotte. Sorry you had to turn the Miranda James book back in. But, to answer your question, yes, reading is definitely a pleasure. Oh, that's funny, Netteanne. I know Betty Webb and her editor. I think it's funny her editor say no it isn't the end of the series. Ha! It's the perfect time of year for cozy reading. Ha, Margie! Well, good luck with that Louise Penny idea. She had 900 people show up at one venue recently. I don't think some people would be as excited about a non-Gamache book. Thank you for saying you'll be glad to write a post. I'm looking forward to it! Mark, That's great to hear about Murder on Cape Cod. I have a copy I want to get to soon. A plug for eBook readers who might be interested: a friend told me about a new book called THE PERRY MASON BOOK: A COMPREHENSIVE GUIDE TO AMERICA'S FAVORITE DEFENDER OF JUSTICE by Jim Davidson. It's an incredible 2,000 page reference book with illustrations, bibliography, and index...for $4.99 (on Amazon)! He covers ALL of the Mason books and stories, and for fans of the 1957-66 Raymond Burr series, this has every episode's guest actors, writers, directors, etc. He even covers newspaper, magazine, and comic book appearances, plus the continuation of the Mason series by Thomas Chastain. No fan can possibly pass up this bargain. I'll try a list again. I think I'm close to my record of reading. I read Shadow Tyrant by Clive Cussler; one of the NUMA books. I was actually surprised by a twist. Cyber Countdown by Terence Flynn; an espionage novel where everybody is too good looking. To Die in Vienna by Kevin Wignall; A surveillance expert is on the run after his subject is disappeared. In The Wrong hands by Avi Domoshevizki; medical thriller about a cancer cure/undetectable poison. Cruise The Storm by David Chillcott; A Die Hard rip off that should be whole lot more exciting. Lesa, I'm on a blogging break right now, but I'll be doing a 'looking back' and '2018 favorites' post on December 28th. Haven't written it yet, but do you want to have me send you the 'favorites' section of it at the end of the year? You could run that part of it in January if you'd like. Let me know. I shared the list of books last night at our mystery book group meeting/party/book swap. It was a fun time. You're right, Jeff. That's a fascinating sounding book. Thanks for passing on the information. Thank you, Glen! I'll look forward to reading your post. And, you're right. A NUMA Files book with a twist you didn't see coming? That's surprising. Kay, I'd love to have the favorites section to run in January! Thank you. Oh, I haven't written mine either. There might still be a favorite or two in 2018. I wish I was close to come to your book group. I am reading " Save Ne From Dangerous Men by S. A. Leichox, my new small print selection from GoodReads, Fascinating woman, book store owner and constant reader and at night a private eye. Beautiful,intelligent, very funny and I am really enjoying it. Read Portrait of A Sister by Laura Bradford. Loved it Could not reading it. Great writer. Also reading "When I Spoke in Tongues" by Jessica Wilbanks. Great inside look into the Holy Rollers. And I will be starting "All the Phases of the Moon by Judy Reene Singer. I have had a wonderful two weeks off from doctor appointments so I have had more time to enjoy reading, All coming to an end, now have another two weeks of appointments and tests starting Monday. I just started Force of Nature by Jane Harper. I finished Last Call earlier this week. I was disappointed by how the author resolved the story. She did not clearly lay out why the the victim was murdered. I'm in France, with Billy, Kaz and Big Mike. I'm sure we'll figure out 'who dunnit' soon enough, but I worry Benn will run out of war for these 3! Carol, I'm glad you had such a good couple weeks of books! But, I'm sorry about all the appointments. That wears you out, all by itself. Take care of yourself. Jim, I have a couple of Jane Harper's books at home. I hear good things, but haven't had a chance to read them. I get distracted. Let us know what you think of Force of Nature. Holdenj, I wonder what will happen to the series then. On audio, I am listening to Behind Closed Doors by B.A. Paris. In print I have Auschwitz Lullaby by Mario Escobar and Christmas at the Cat Cafe by Melissa Daley. I am still trying to read The 7 1/2 Deaths of Evelyn Hardcastle by Stuart Turton. I normally would have dnf'd by now, by I want to see how it ends. This is awesome! My name is Lesa too!!! I've found it interesting to find the same spelling. Anyway, I am reading Dennis Meredith's Mythicals. It's a fantasy, sci fi, fairy tale all mixed into one. I high recommend it, dennismeredith.com for it's info. He's a great writer!